Gov. 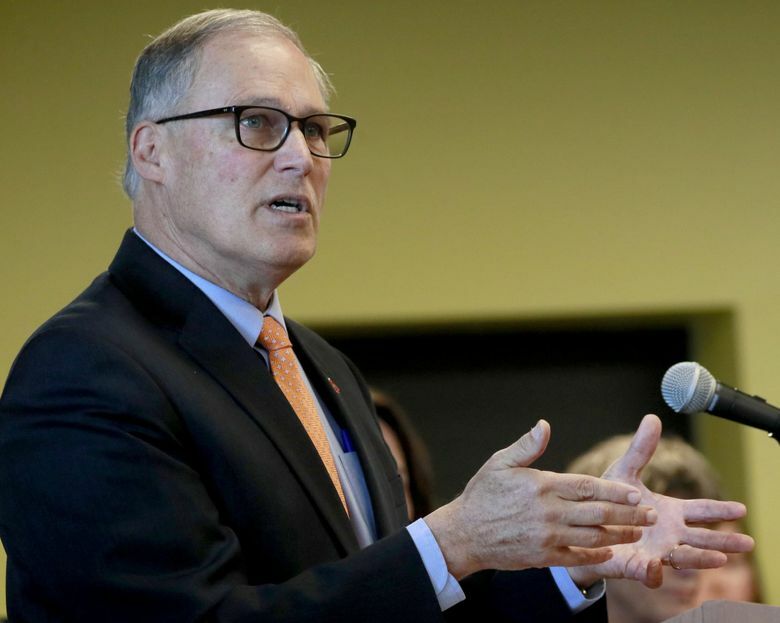 Jay Inslee has proposed a change to the state's most important financial-aid program for college students, changing the program's name and guaranteeing every student who qualifies will receive funding. For almost 50 years, Washington has written billions of dollars in financial-aid checks to Washington college students through a program with a most uninspiring name: the State Need Grant. Now Gov. Jay Inslee wants to give the program a big boost in funding, and to rename it with a sunnier moniker. The budget proposal, which would provide an additional $103 million for the program in 2019-21, would guarantee that by 2021-22, the estimated 93,000 students whose families make 70 percent or less of the state’s median family income will get help paying for college (in 2018-19, that was an adjusted gross income plus nontaxable income of $61,500 for a family of four). And it would rename the program the Washington College Promise Scholarship. “Promise” has become a popular word for state and local scholarship programs in recent years. Tennessee was one of the first states to adopt it when creating Tennessee Promise, which gives all state high-school graduates a tuition-free community-college education. More recently, Seattle voters overwhelmingly approved Mayor Jenny Durkan’s Seattle Promise scholarship, which is rolling out over the next few years and gives Seattle public high-school grads tuition-free community college. Washington College Promise — which could continue to go by its name for a few more years, Thompson said — is different from those programs. Both Tennessee and Seattle promise to pay tuition regardless of a family’s income. But State Need Grant/Washington Promise is only awarded to students based on their financial need. It covers public and some private two- and four-year schools and apprenticeship programs, it allows students to go to school part time, and the amount of the award is not reduced if a student receives money from other sources, like institutional scholarships or federal financial aid. It began payments to students who had financial need starting in 1972, said Rachelle Sharpe, deputy executive director of the Washington Student Achievement Council, the state agency which administers SNG. Washington has long been a leader in need-based financial aid, awarding $366,249 to 84,395 students in 2016-17. In that year, eight states (California, New York, Texas, Pennsylvania, New Jersey, Illinois, Washington and Virginia) collectively awarded about $5.6 billion in undergraduate need-based grant aid, accounting for about 70 percent of all aid of this type. Among the states, Washington was second only to New Jersey for per-student award amounts. Financial aid available to Washington residents also includes the College Bound scholarship program, which guarantees the state will pay college tuition for low-income students who sign up by 8th grade, maintain at least a 2.0 GPA and stay out of legal trouble. Sharpe said the proposal, if it passes, would make the program more like a Pell Grant, a federal aid program. A student could plug the family’s income into a formula, and figure out how much he or she can expect to receive in state aid. In 2018-19, the maximum award ranged from $2,823 (for attending one of the state-approved private two-year, for-profit colleges) to $9,745 (for attending the University of Washington). Because the program hasn’t been fully funded for the last decade, between 22,000 and 34,000 eligible students didn’t receive any state money each year as the funds ran dry, but decided to go to college anyway — often taking out student loans to do so. No one knows how many students didn’t receive funds and then decided not to go to college, Thompson said. To apply, students fill out the Free Application for Federal Student Aid (FAFSA), or for undocumented students, the Washington Application for State Financial Aid. Each individual Washington college or university decides who gets the money and how much they’ll receive.